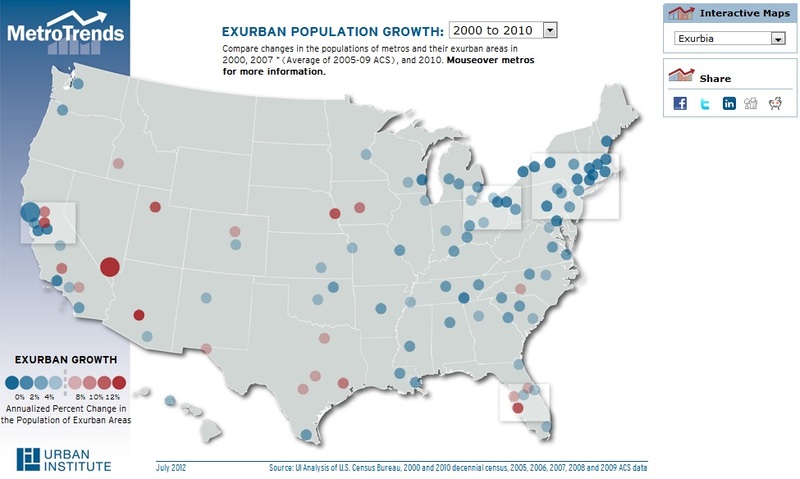 Don't miss our latest MetroTrends commentary: US Census Bureau Researchers Todd Gardner and Matthew Marlay analyze exurban population growth since the Great Recession. Over the last decade, the rate of growth in exurbia far outpaced that of the United States as a whole. Between 2000 and 2010, the U.S. population grew from about 281 million people to 309 million people, or about a 10% increase. During the same period, the exurban population grew from about 16 million to almost 26 million people, an over 60% increase. In both cases, the growth rate slowed substantially after 2007: the overall U.S. population grew by 7% from 2000 to 2007 (averaging about 1% annually), but by just over 2% from 2007 to 2010 (only about 0.8% annually). Meanwhile, the exurban population grew by 44% from 2000 to 2007 (about 6% annually), but by only about 12% from 2007 to 2010 (about 4% annually). Click below to see our interactive map.